Many teams will play a 2-3 zone to defend against the out-of-bounds play under the basket. Here are some plays you can run against a 2-3 zone. When O1 yells "go", O5 seals the inside defender. O2 (your best shooter) cuts around O4's screen to the ball-side corner. O2 could get the pass here and the three-point shot. Now if the X4 defender to moves out toward the corner, O4 slides down the lane into the gap looking for the pass and shot (Diagram B).You should have a 2-on-1 situation with the X4 defender. Either O2 or O4 should be open. We stack on the ball-side lane line, and make sure the stack does not start too low... get them up near the elbow. Your best outside shooter is O2, and O4 and O5 are post players. O1 is the point guard. O2 cuts to the corner calling for the ball. 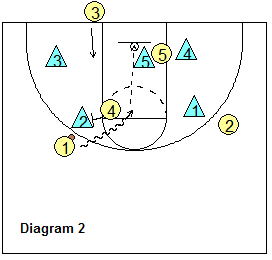 This will probably get the outside low defender (X3) to move out to the corner with O2. Meanwhile, O5 screens on the middle defender, and O4 slides into the gap created by the screen, for the inbounds pass and easy shot (diagram B). O1 is your safety and splits out to the ball-side wing. Diagram C. If the X3 defender stays inside, then O2 is open in the corner for the three-point shot. The inbound passer O3 has to read what the X3 defender does... if X3 goes outside with O2, pass inside to O4. If X3 stays inside, pass to O2 in the corner. Here’s another baseline out-of-bounds play you can run against the 2-3 zone. 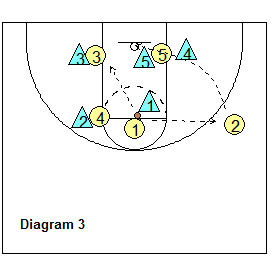 In diagram A, your strong post player (O5) sets a screen on the middle defender X4. O4 cuts around the screen, moving out to the short corner or corner area, calling "ball, ball, ball". This should get the X5 defender to move outside also onto O4. Now O5 seals for inside position, gets the inbounds pass and the power lay-up (diagram B). Notice that O2 can cut to the opposite short corner for a shot, or maybe even steal the inside position from the X3 defender for a lay-up. O1 is our safety for the outlet pass if nothing develops inside. After making the inbounds pass, O3 should move to the opposite corner-wing area. See the diagrams below. Put your best shooters on the blocks. They will split out wide to the corners looking for the pass and corner 3-point shot. Stack your two post players in the middle near the free-throw line. After O1 and O2 start their cuts to the corners, hopefully the outside low defenders will go with them to the corners. O3 and O4 cut around the middle defender to each block... one should be open for the lay-up. Or, a corner 3-point shot may be open if the defenders stay inside. 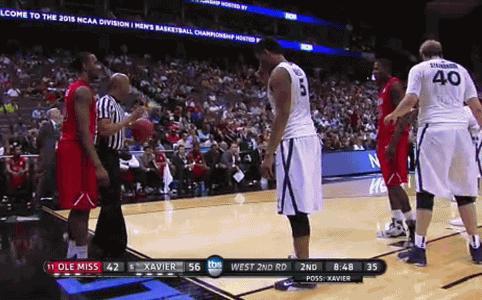 This play will get you an open shot from either the free-throw line, or the right wing. In diagram 1, we start with the guards in the corners and the posts at the elbows. O4 screens the X2 defender so that O1 can get the inbounds pass on the left top area. O2 cuts up to the right wing, and O5 cuts between the X5 and X4 defenders. 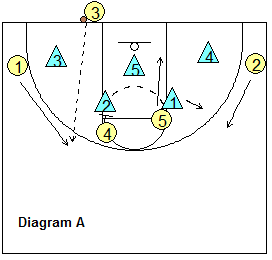 O4 then ball-screens for O1 (diagram 2), and O1 dribbles around the screen for pull-up jump-shot at the free-throw line. Notice that O3 moves inbounds, sealing the X3 defender for inside position... which puts him/her in position for either a dump-down pass inside, or an offensive rebound. If the X1 defender drops inside to defend O1, O1 either kicks out to our shooter O2 for the open 3-point shot, or looks for O3 inside.